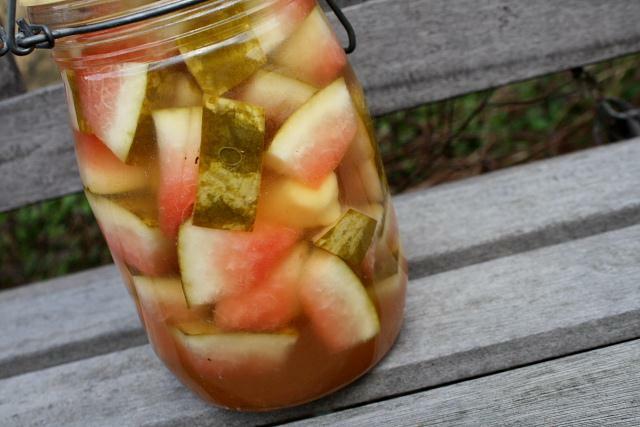 Ever thought about pickling a watermelon rind? It’s good to be frugal, but there are times when frugality goes too far and tips over into just plain old stupidity. This recipe falls just to the right side of OK – pickling a watermelon rind, you know, the green part that gets chucked on the compost pile, sounds ridiculous, and it would be, if the result wasn’t so good. It’s one of those ‘silk purse out of a sow’s ear’ type of recipes…something unpromising transformed into something worth eating. On top of that, it only takes a couple of minutes to put together, so for the cost of a few hundred millilitres of vinegar and a handful of spices, it’s worth making good use of something that would otherwise just end up in the bin. First of all, you need watermelon rind, which means you need a watermelon, a big, basketball-sized specimen should do it. Eat the red flesh, but save half of the rind, peel some of the toughest green rind away and chop it up into two centimetre square pieces. Next, knock together a pickling liquid from about 225ml of rice wine vinegar, 125ml of water, a tablespoon and an extra quarter teaspoon of salt, 100g of sugar, a whole star anise and a thumb-sized piece of peeled fresh ginger (does ginger ever get measured in any unit other than the size of a thumb? I think not). Bring to the boil and stir to dissolve the sugar and salt before adding the watermelon rind and cooking for one minute, just enough to start to soften the rind a little. The salt and sugar will finish the job off. Transfer everything to a suitable air tight container, about a litre in volume. A Kilner jar fits the bill. The pickle is ready after a few hours, and it’ll keep refrigerated for a couple of weeks. After that, the rind will start to get too soft and mushy…over-pickled. This pickle is best when it’s still fresh and the rinds still have some bite to them. cookbook. Chang recommends eating this pickle as part of an impromptu frisee aux lardons – frisee, pickled watermelon rind, bacon lardons, a poached egg and a vinaigrette boosted with some of the pickling liquid. Watermelon and bacon? It sounds odd, but remember that you’ve just pickled the skin of a watermelon, so it might be worth a punt. My Japanese grandmother pickles watermelon rinds like this: peel the green part off, rub in salt and leave a few hours in a tupperware. More like quickles I guess, but taste like cucumber sorta. Is this sort of pickle very common in Japan? Never thought about it. Would consider it, but for bar salt none of the pickling ingredients are regulars in our larder. Is that where we are going wrong?! I cook a lot of Indian food, so I had star anise fro that. Fresh ginger, too, chopped up into chunks and frozen – it freezes really well..I just buy a load of it from Haqs or Pakeezah every once in a while and stash is away for things like this. The rice vinegar was leftover from some other southeast Asian food adventure. My cupboards are litterered with half-used bottles of odd things from past experiments! White wine vinegar would probably be a decent substitute, but I think I got the rice wine version easily enough from the big Chinese supermarket in Leeds. Oh Wow I haven't heard of this in years. My mom used to make it all the time, what a great memory. Thank you. I love pickled watermelon rind. It's a must at every Thanksgiving dinner with my family. I have never thought of picking the rind myself, and you've inspired me to give it a try, especially since I eat a lot of watermelon in the summer! 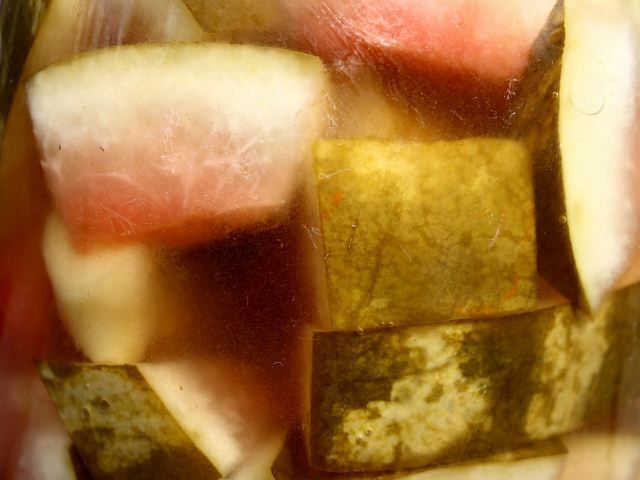 Is pickled watermelon a Thanksgiving staple? I had no idea. I've heard of pickled watermelon rind before but never had the chance to try it. I thought the recipe was much more difficult, but this sound so easy and delicious! Once I finally getting around to buying an organic watermelon I'm definitely making this. I wouldn't be so tempted if it didn't sound so delicious and refreshing. Thank you for a great recipe! It's really quite easy…maybe ten minutes work in total. Hi there. I have the cookbook and just made these. I found them quite tasty, but found they were softening too much for me after only a couple of days. I believe the recipe calls for you to carefully remove the green skin — did you find the skin too tough to eat? We had them w the recommended salad, which was fantastic. What’s that pasta really called?